A weird and wonderful place for garage rock culture. Youtube channel. Art Store. Pedal shop. 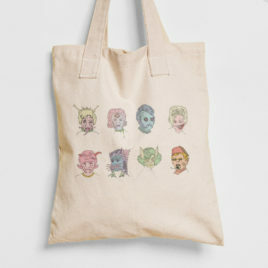 Adorable and functional 6oz canvas bag featuring my Monster Bop design! Such adorable and original characters! Give your most ghoulish friend this adorable and hilarious tote! Show off your love of monsters while shopping! Take this tote to school and fill it with all sorts of books and materials! No need to hide in the shadows! Be a shining monster lover, and wear this tote with pride! All my totes are printed on BAGedge canvas tote bags and are 100% cotton! My printing service Printaura guarantees an excellent print job! And of course, I design the print. This tote is BAGedge's 60z bag. It's my favorite size tote... pretty standard. Makes a great purse or shopping bag. 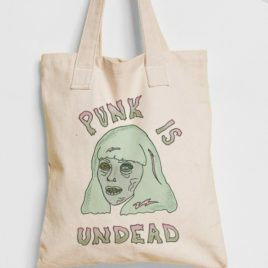 Adorable and functional 60z canvas bag featuring my PUNK IS UNDEAD design! Because punk isn't dead... it's UNdead!